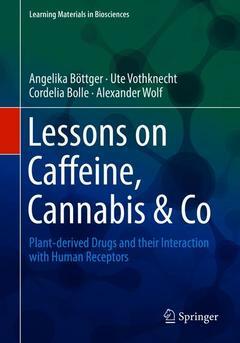 Introduction: Plant secondary metabolites and their general function in plants.- Historical and current perspective.- Medicinal use.- Recreational use.- General overview over biosynthesis pathways of plant secondary metabolites.- Drugs affecting GPCR: GPCRs in plants and animals.- Dopamine and 5-HT2A-serotonin receptors – Cocaine, mescaline, psilobin.- Opiate receptors – morphine, salvinorin A.- Cannabinoid receptors – THC.- Muscarinergic acetylcholin receptor - muscarin, atropine.- Adenosine receptor – caffeine.- Drugs affecting ion channels: Ligand and voltage activated channels.- Nicotinic acetylcholin receptor – Nicotine, Curare.- GABAA/C-receptor – Muscimol, thujone.- ionotropic Glycine receptor – Strychnine.- ionotropic Glutamate receptor - ibogtenic acid, kainic acid.- TRP channels – capsaicin, menthol, aconitine, resiniferatoxin.- Anti-cancer drugs acting on the cell cycle: Cell cycle in animals and plants.- Microtubuli - Colchicine, taxol, vinblastine, Podophyllotoxin (Lignan).- Topoisomerase - camptothecin, etoposide.- G2/M phase arrest, apoptosis – curcubitacin, triptolide. Prof. Dr. rer. nat Angelika Böttger is an Adjunct Professor at the Department of Cell Biology, Ludwig-Maximilians-Universität München. She is currently investigating signalling pathways of embryonic development and especially their role in regeneration of the freshwater polyp Hydra. Moreover, she is analysing the enzymes involved in oxygen sensing in animals. She teaches general cell biology and special courses on signal transduction. Prof. Dr. rer. nat. Ute C. Vothknecht is Professor of Plant Cell Biology at the Institute for Cellular and Molecular Botany, Rheinische-Friedrich-Wilhelms-Universität Bonn. Her research focuses on calcium signaling involved in environmental stress response and plant development. Within this context, she especially investigates the function of plant organelles. Dr. rer. nat. Cordelia Bolle is Scientist and Lecturer at the Department of Plant Molecular Biology/Botany, Ludwig-Maximilians-Universität München, Germany. Her research aims at elucidating the light-dependent signal transduction in plants especially phytochrome A signaling. She teaches general plant biochemistry and special courses on interactions of plants with their environment. Dr. Alexander Wolf (Ph.D.) is a Helmholtz Young Investigator Group Leader in the Institute of Molecular Toxicology & Pharmacology at the Helmholtz Zentrum München-German Research Center for Environmental Health. He is interested in the basic mechanisms of epigenetic regulation via modifications on proteins and nucleic acids, the overall patterns of which can vary due to external stimuli. A central topic of his research is how dysfunction of the epigenetic network can cause severe defects, like cancer.